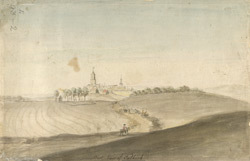 View of Falkirk in central Scotland, drawn in c.1775. The towns name is derived from a church here which became known by the name ‘Eglebreth’ the Cumbric for ‘Speckled Church’. The Gaelic translation was ‘Faw Kirk’ and over time this became Falkirk. The town was occupied by the Romans from the first century and Falkirk is well known for the Antonine Wall, a 37 mile wall built in AD142-3 by Antonius Pius to mark the northern extremity of Roman territory in Britain. Falkirk was an important cattle market town in the 18th century. Falkirk was also the site of two important Scottish battles, the first in 1298 at which William Wallace lost and the second in 1746 when the Jacobite’s defeated Government forces.